The selection of the patient for cataract surgery with toric IOLs is a very delicate issue and we have decided to discuss it with José L. Güell who is not only one of the best cataract refractive surgeon but also has a thorough scientific background as professor of Ophthalmology and ESASO coordinator and is renowned in the international ophthalmological field as past-president of EUCORNEA and ESCRS. Who is the ideal patient for cataract refractive surgery with toric IOL? The precision in correcting astigmatism for most Toric pseudophakic IOL’s available today is quite high. Most models have demonstrated quite high predictability and, most important, stability of the correction. That is why today, in my practice, most patients with stable corneal astigmatism are good candidates for Toric IOL implantation. Taking into account the adequate rotational stability of most IOL models, the critical point is a proper alignment. That is why an adequate preoperative evaluation including both anterior and posterior corneal astigmatism, as well as an adequate surgical alignment technique are mandatory. Fig. 2. 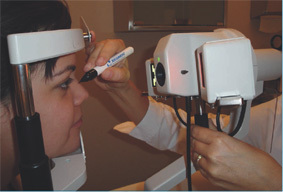 Pre-operative marks at the ophthalmoscope. In between the current available alignment techniques, we may use the simplest or the more sophisticated ones, without significant clinical and refractive differences between them if we review the published work. 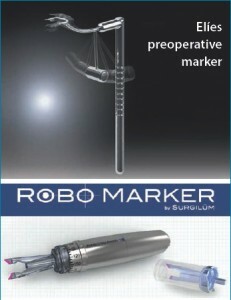 On the simplest side, I would like to mention the use of a preoperative reference mark (on the ophthalmometer or with the Elies marker or Robomarker for example) or the use of the topographic image on a high quality ocular surface photography (as the one that the Cassini topographer provides) where you may clearly see the steepest meridian and distinguish limbal details and, on the more sophisticated side, we may use different systems. The ones I have worked with are: the Verion from Alcon, the Callysto from Zeiss and the Trueguide System from Truevision (see pictures). Fig. 4. The Verion system from Alcon. Can toric IOLs be recommended for patients suffering from keratoconus or after corneal graft to treat the remaining astigmatism? As long as in both situations, keratoconus and after corneal transplantation, the astigmatism is stable (no changes in a minimal period of 12 months) and the regular component is the main issue (if the irregular component is significant, best spectacle corrected visual acuity will be significantly inferior to best corrected visual acuity with a rigid gas permeable contact lens and should not be superior to one Snellen line in an ideal indication), I think we have enough support with the current published data to also use Toric pseudophakic IOLs in these subgroups of patients. Corneal Astigmatism may obviously change on the long term (as it may also happen on regular non operated eyes with age) but the superiority on the results regarding uncorrected vision and thus quality of life is so significant that I am one of those surgeons supporting their use under the described circumstances. Of course, we must explain to our patients the possibility of future changes as well as the different therapeutic options we will consider if this happens, from the use of additional correction (spectacles, contact lenses) to the consideration of an additional surgical procedure if not contraindicated (laser refractive surgery, IOL exchange, anterior or posterior chamber “piggy-back” IOLs). Ideally in the near future we will have the possibility of changing the IOL power in place with new technologies which are today on the pipeline. Fig. 5. The Callysto system from Zeiss. Fig. 6. The TrueGuide system from TrueVision. Which is the cut-off value of astigmatism to recommend cataract toric surgery? I am actually using Toric pseudophakic IOLs in most of my cataract patients when the net corneal astigmatism is equal or higher than 1.00 D. May be in the near future, as general cataract surgery refractive predictability improves, this cut-off value will be lower.